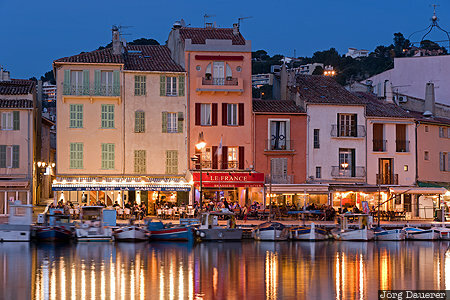 The harbour of Cassis at the (Port de Cassis) mediterranean sea with illuminated restaurants and boats and their reflexions in the water at the blue hour after sunset. Cassis is in Provence-Alpes-Côte d'Azur in the south of France. This photo was taken in the evening of a sunny day in March of 2015. This photo was taken with a digital camera.